Here's another simple idea that brings a smile to everyone who tries it out. 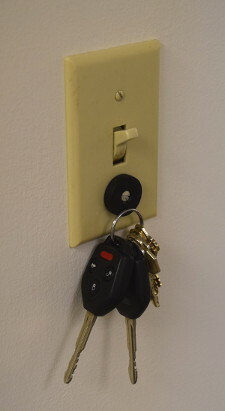 Strong neodymium magnets placed behind a light switch make a great key-ring holder! We’ve seen a few DIY examples of this. In most, a strong neodymium magnet is placed behind an existing switch-plate. It’s a simple solution that works without too much trouble. We were a bit nervous about sticking powerful, electrically conductive magnets inside a junction box with live, exposed wires in it. If that magnet starts moving around in there, it’s possible to short something out. If you use this simple approach, please be sure to make sure that magnet isn’t touching any conductors! Warning! 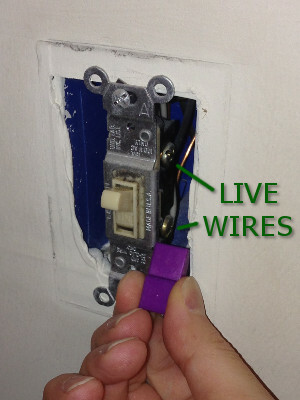 If you remove the switch-plate from a switch, you now have access to dangerous, exposed electrical wiring. If you don’t know what you’re doing, consult a qualified electrician. Even if you do, please turn off power to the switch using the proper circuit breaker before doing any work. Please don't electrocute yourself. To illustrate the idea safely, we thought some of our plastic coated magnets might work. We used a pair of B888PC-PUR magnets side-by-side with some success, but found it difficult to fit alongside some switches. Depending on the size of the actual switch, there wasn't always a 1/2" gap of space left for magnets to fit. We looked at a few other options, but didn’t like fingers or magnets so close to live electrical current. Placing some B888PC-PUR block magnets alongside a switch, with north and south poles facing out. Danger: Live wires are clearly visible. Turn off power before attempting, or don't attempt. For a better magnetic solution, we 3D printed a custom switch-plate with a little extra space at the bottom for a few magnets. Like the magnetic knife holder we made, a number of magnets in a row works best. The poles facing out are alternating (north, south, north, south, etc. ), making the field strength quite strong where the magnets meet. This provides more pull force to the small amount of steel available in a typical key-chain ring. Since most keys are made of brass, the keys themselves don’t stick to magnets. Only the steel ring is attracted. The steel ring is thin, which limits the total force you can feel, even with a very large magnet. We ultimately used 5 B884 magnet blocks, each ½” x ½” x ¼” thick. Check out our results! The video below shows a sped-up version of the printing process, plus some quick demonstrations at the end. Want to print one yourself? Download the model file we made and print it on your own 3D printer. You can also find it on Thingiverse. 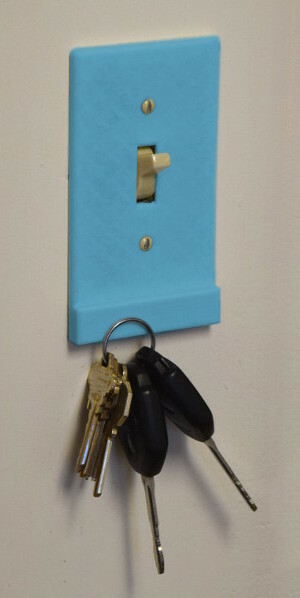 While we showed the idea with a plastic, 3D printed switch-plate, you can certainly construct yours in other ways. You might modify an off-the-shelf switch-plate. They make some oversized ones that might work quite well for this. 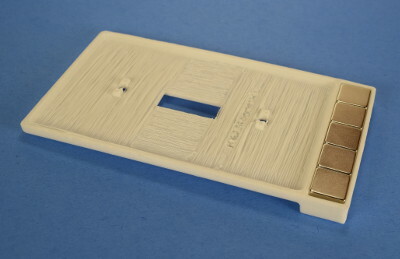 Also, a simple wood switch-plate might be crafted with much nicer quality. What about a really quick and easy version, without a complicated construction project? We like attaching a simple countersunk magnet with the screws that are already used on the switchplate. If they're long enough, you can attach a magnet with the same screw. Pictured is a durable, plastic coated RX034DCSPC-BLK ring magnet, but you could use other magnets like a 3/4" diameter RC22CS-N or 1" diameter RX033CS-N.